What Type of Surgeon Does Gallbladder Surgery? Gastric sleeve surgery is a weight loss procedure that reduces the size of the stomach by approximately 85 percent. The excess portion of the stomach is removed, leaving a vertical tube -- sleeve -- that considerably limits your food intake. The procedure was developed as the first stage of a more extensive operation that involves rerouting the digestive system as well as removing most of the stomach. The gastric sleeve may also be used as a stand-alone procedure in high risk people, including those with a complicated medical or surgical history, or a very high body mass index. As with any surgery, people who undergo gastric sleeve surgery are at risk for certain complications. The surgeon performs the gastric sleeve laparoscopically using an instrument with a tiny camera that is introduced into the belly through several small incisions. 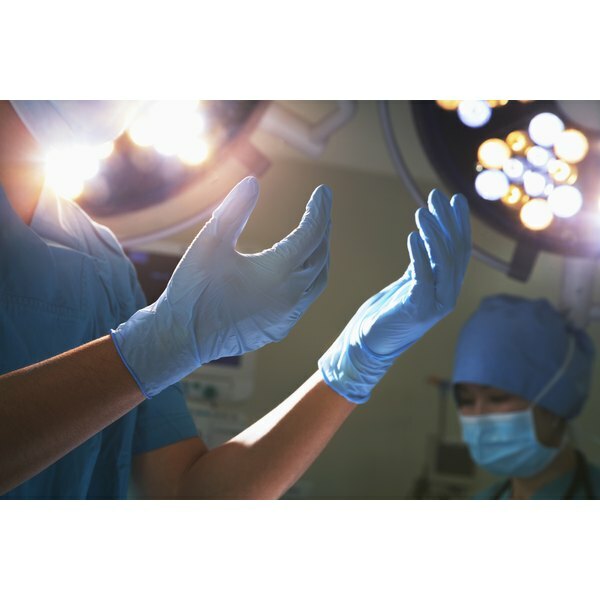 Although this is a minimally invasive procedure compared to one that is performed through a large abdominal incision, any surgical procedure involves some risks. Early complications may include bleeding, blood clots, leaking at the surgical site, or infection. Possible anesthesia complications could include breathing problems and allergic reactions. There is also some risk of damage to the stomach, intestines or other organs, internal scarring or leaking from the surgical site. With gastric sleeve surgery, the digestive system remains intact except for the reduced size of the stomach, so many of the complications of gastric bypass procedures are avoided. However, you may experience long-term nutritional deficiencies of certain nutrients, including vitamin B12 and iron, because so much of the stomach is removed. People who undergo gastric sleeve surgery generally do not lose as much weight as gastric bypass patients lose, and the rate of loss is slower. If the weight loss is inadequate, it may be necessary to perform a second operation to aid weight loss. A kink can form in your gastric sleeve, causing nausea, vomiting, difficulty swallowing or food intolerance. This may resolve on its own, or may require surgery.